I have a confession to make. I’m not always reading feminist manifestas and animal-loving vegan blogs. I know, I know…you’re all shocked. In my spare time, I’m often perusing one of my fave sites, Apartment Therapy. You’ll find me ogling house tours, quirky home décor and teeny tiny apartment makeovers. I swear I was an interior designer in another life. But what did my little eye spy the other day?? Vegan recipes! Cross-posted from their sister site The Kitchn, the foodie blog boasted a round-up of 15 vegan recipes. Wait, 15 vegan recipes?? On a non-vegan, non-vegetarian site?? Oh these I had to see! 1. Tofu and Veggie Pot Pie – A hearty, comforting entrée of tofu, pungent onions, delicate celery, earthy potatoes and sweet peas seasoned with soy sauce, savory sage and lemon-peppery thyme and topped with a simple crust of flour, vegan butter (Earth Balance) and water. 2. Chickpea Curry – A spicy and creamy Thai-style curry of chickpeas, coconut milk, juicy tomatoes, cauliflower, hearty potatoes and a vegan fish sauce (here’s a recipe for vegan fish sauce). 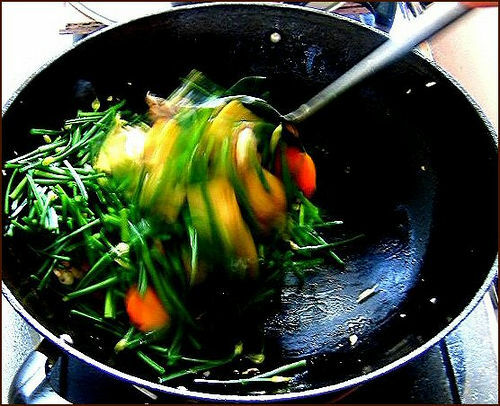 Fish sauce is a staple of Thai and Vietnamese cuisine. But now you can veganize recipes while mimicking the authentic flavors. Genius! 3. Indian Khara Bath – A South Indian “soul food” dish of rava (ground husked wheat) with tomatoes, peas and carrots flavored with fragrant ginger, warm cumin, earthy turmeric and saffron. 4. Quick, Easy, One-Bowl, Veg Meals – A template for making a one-stop meal -> Grains + Veggies + Protein + Garnishes + Sauce. Includes recipes for sauces to enhance any dish: Avocado Dressing, Carrot-Ginger Dressing, Curry-Coconut Sauce, Gandhi’s Curry Sauce, Green Tea Sesame Sauce, Spicy Peanut Sauce, Tahini-Miso Dressing. 5. Deli-Style Tempeh Salad – Tempeh, garbanzo beans, carrots and herbs in a dressing of vegan mayo (Vegenaise), mustard and sweet yet tart apple cider vinegar. This salad can be eaten in a pita or on top of a bed of greens. 6. Kimchi Tofu Summer Rolls – A spicy fusion of classic Korean and Vietnamese flavors. Rice paper wrappers filled with vermicelli, tofu, vegan kimchi (here’s a recipe for vegan kimchi), crispy carrots accompanied by a soy, sesame and chile powder sauce. 7. Nutty Farro Pasta with Edamame Pesto – Nutty, chewy farro topped with a Japanese twist on pesto consisting of edamame, roasted almonds and cool mint. 8. Vegetarian Bánh Xèo (Vietnamese Crêpes) – Crispy, egg-free crêpes made from rice flour, coconut milk, and turmeric are filled with yellow mung beans, baked tofu and fragrant cilantro smothered in a tangy and citrusy garlic, soy and lime sauce. 9. Tacos de Papa (Potato Tacos) – This is an easy Spanish recipe of hearty corn tortillas filled with crispy red potatoes, creamy avocado, poblano peppers, sweet red peppers, crunchy corn and fresh cilantro. 10. Dal Palak – An Indian entrée of red lentils, hearty potatoes, juicy tomatoes, earthy mushrooms and leafy spinach flavored with pungent ginger and garlic, and spiced with lemony coriander and pungent garam masala. 11. Pumpkin Tortilla Soup – Rich pureed pumpkin and creamy avocado swirl in a tomato base, spiced with warm cumin and piquant cayenne, and topped with crispy, crunchy corn tortillas. 12. Savory Kabocha Tofu Pie – Sweet kabocha (a winter squash) and mashed tofu comingle with pungent onion, garlic and aromatic rosemary, all in a hearty, wheat crust. 13. Pasta with Butternut Squash, Sage and Pine Nuts – Roasted butternut squash, sweet onion, pungent garlic and savory sage make a hearty sauce tossed with farfalle pasta and toasted pine nuts. Just omit the grated Parmesan cheese to make the dish vegan. 14. Kale and Potato Gratin – A simple gratin (a dish with a browned crust) comprised of red potatoes, leafy kale, bread crumbs and fragrant herbs. Omit the grated cheese to make vegan. 15. Leeks Braised with Wine and Garlic – Okay, this dish requires a few substitutions to make it vegan. Swap the dairy butter for vegan butter (Earth Balance), chicken stock for vegetable broth, and be sure to use a vegan white wine. Can be eaten as a side dish or topped over rice or pasta as an entrée. Either way, braised leeks doused in vegan butter, garlic, wine and lemon?? Sounds divine. Which recipes do you want to whip up?? Tags: banh xeo, chickpeas, crepes, curry, dal palak, gratin, Indian cuisine, kale, Khara Bath, kimchi, leeks, lentils, pasta, pesto, pot pie, potato, pumpkin, recipes, soup, Spanish cuisine, squash, tacos, tempeh, Thai cuisine, tofu, vegan, Vietnamese cuisine. Bookmark the permalink.